With their purple blooms, sea lavender plants seem like pretty flowers when you see them growing on California's coastline. But looks can be deceptive. Limonium sinuatum, one species of sea lavender in California, is considered invasive and can crowd out native grasses and plants. 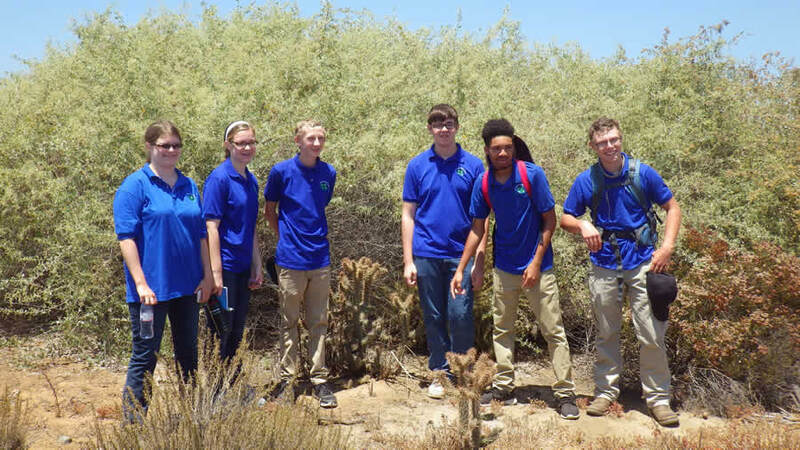 Students from the National 4-H GIS Leadership team, who visited San Diego, California, for the 2015 Esri Education GIS Conference in mid-July, spent a day at the Tijuana Slough National Wildlife Refuge (south of Imperial Beach) collecting location data for the invasive plants. 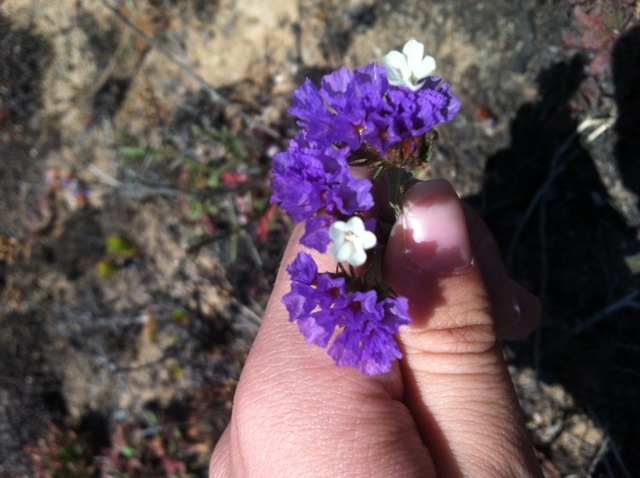 The US Fish and Wildlife Service (USFWS) plans to eradicate the Limonium sinuatum in the refuge. The USFWS will use data the students collected and mapped using Esri technology to help formulate techniques to manage the problem and come up with an eradication plan. The National 4-H GIS Leadership team traveled about 11 miles south of San Diego to the Tijuana Slough National Wildlife Refuge. 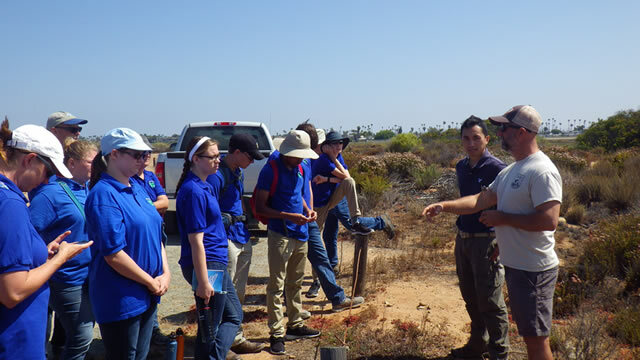 The 4-H students met with Kurt Roblek, a USFWS wildlife refuge specialist, who introduced them to the refuge and to Limonium sinuatum, commonly known as sea lavender or statice, the invasive species that they would map. Limonium sinuatum is beautiful but troublesome. The refuge where the students did the mapping has unique wetland ecosystems, such as salt marshes, brackish pools, and coastal sage shrub habitats. The USFWS works to conserve and protect the area and uses GIS to organize data in order to make the best decisions about treatment for invasive species such as the Limonium sinuatum. Kurt Roblek (far right) and Pek Pum from the US Fish and Wildlife Service introduce the 4-H team to Limonium sinuatum, also known as sea lavender or statice. Roblek told the students that sea lavender produces a large amount of highly viable seeds. 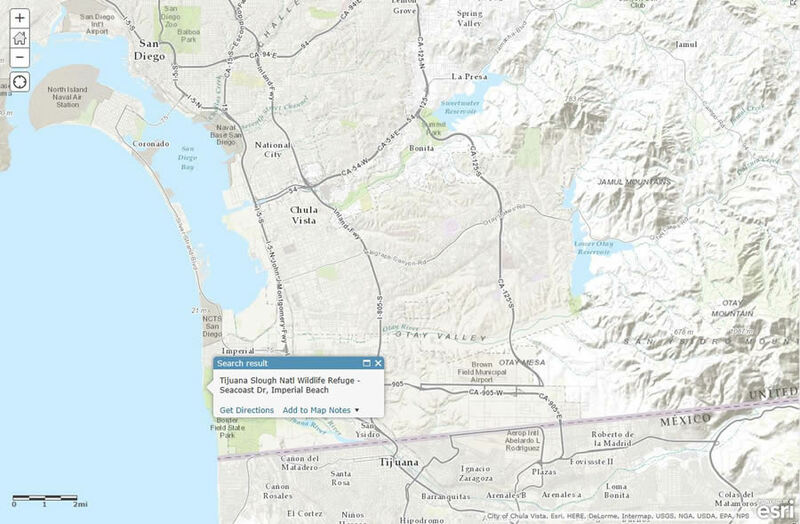 The plants, he said, were probably introduced to the refuge when seeds from the gardens of nearby homes were washed into the Tijuana River. Pek Pum, a GIS specialist for the USFWS, showed the students how to enter plant location data using mobile devices loaded with the Collector for ArcGIS app. The app was set up with a layer of grid points spaced 50 feet apart. The 4-H team divided into groups and counted the plants within a 10-foot radius of each point. 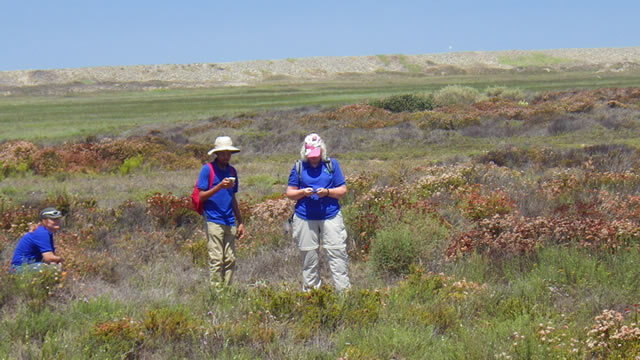 4-H GIS Leadership team member Dylan Dodson (center) collects sea lavender location data using Collector for ArcGIS. Instead of entering the exact number of plants, the team members chose from predetermined ranges of values from a drop down list. After sorting out technical issues, the greatest challenge was watching out for jumping cholla cactus plants—eager to stick to the students. The spines had to be pulled out with pliers. After working in the field, the 4-H students ate lunch and made sure to sync up their maps. Tim Prather, an extension specialist in the Biosystems Engineering and Soil Science Department at the University of Tennessee, demonstrated how to filter the data points and perform analyses using ArcGIS Online software. The students interpolated the points to predict the sea lavender spread and areas of higher density. Sarah Martin of New York state; Mary Katherine DeWane, Austin Ramsey, and Edward DeWane of Tennessee; Dylan Dodson of North Carolina; and Wyatt Luther of Tennessee stand in the Tijuana Slough National Wildlife Refuge, ready to map invasive plants.